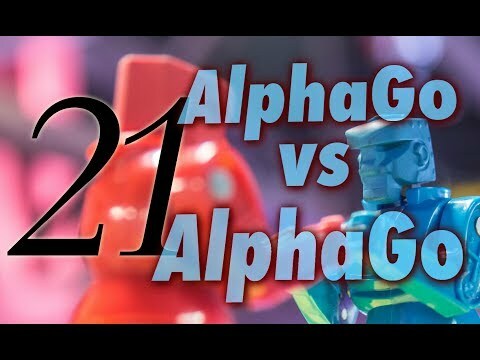 In AlphaGo self-play game 21, the AI’s play is “a little less alien,” says Michael Redmond 9P in his latest game commentary, hosted by the AGA E-Journal’s Chris Garlock, adding that the game features some moves that human players have been playing recently. “And then towards the end of the games there’s just a lot of exciting fighting.” Redmond’s commentaries return after a late-summer break; he’ll also be doing some live commentaries on Twitch in early September during a visit to the National Go Center in Washington DC; stay tuned for more details soon. Kyo makes good start in Gosei : The 43rd Gosei best-of-five title match got off to a start on June 23. 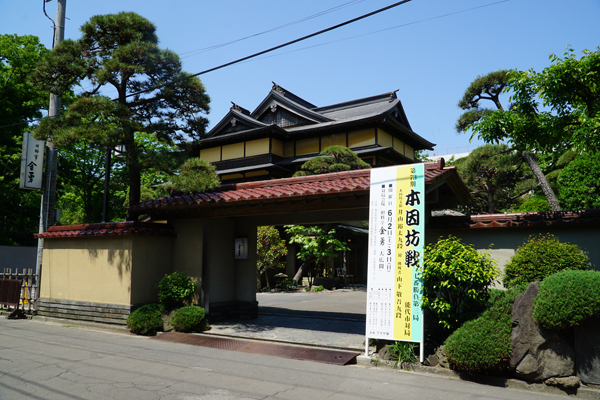 The venue was the Hokkoku (North Country) Newspaper Hall in Kanazawa City, Ishikawa Prefecture. The Hokkoku Newspaper is a member of the Newspaper Igo Federation, a group of 13 regional newspapers that sponsor the Gosei tournament. This year the challenger is Kyo Kagen 7-dan, who is making his title-match debut. He was born in Taiwan, where he is known as Hsu Chiayuan (Xu Jiayuan in Pinyin). 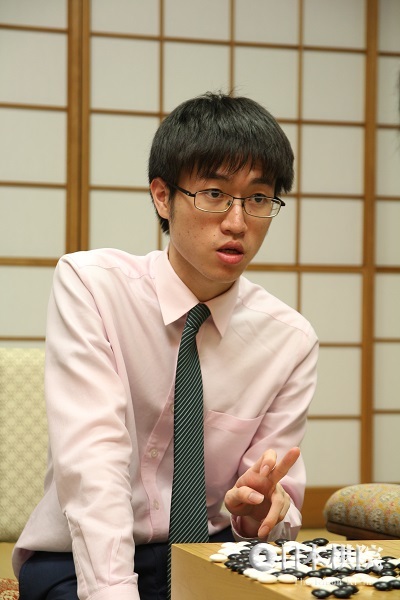 Kyo has already made a name for himself as one of the most promising younger players in Japan; he was promoted to 7-dan in 2017, when he won a seat in the Kisei S League. He will turn 21 onDecember 24. In the first Gosei game, he drew white and forced Iyama to resign after 226 moves. Kyo made a very severe attack that brought Iyama to his knees. Of the time allowance of four hours each, Kyo had three minutes left; Iyama was down to his last minute. 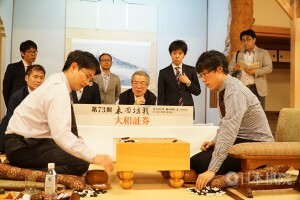 The second game was played at the Nihon Ki-in headquarters in Tokyo on July 6. The game concluded after 271 moves with Kyo (black) winning by 1.5 points. Once again Kyo slugged it out toe to toe and took the lead. Iyama’s septuple crown seems to be in serious danger. The third game will be played on July 3. Kobayashi Koichi wins tournament for senior players: According to Go Weekly, tournaments for around eight players are popular in various places in China and “legendary” Japanese and Korean players are sometimes invited to take part. On July 1 and 2, the city of Shaoxing in Zhejiang Province held the 1st International Weiqi Great Players Tournament to commemorate the building of a weiqi hall. (Shaoxing is a city of five million and is well known for the rice wine of the same name.) The participants were all top players in the last century, so I will give all the results (all players are 9-dan; I don’t have full details of the games). (Round 1, July 1) Ma Xiaochun (China) beat Yang Jaeho (Korea), Kobayashi (Japan) beat Rin Kaiho (representing Chinese Taipei), Cao Dayuan (China) beat Seo Bong-soo (Korea), Nie Weiping (China) beat Takemiya Masaki. (Round 2, July 1) Kobayashi beat Ma, Nie beat Cao. (Final, July 2) Kobayashi (W) beat Nie by 4.5 points. Ryu wins seat in 2018 Samsung Cup: The international preliminaries for the current Samsung Cup were held in Seoul from July 2 to 7 with about 380 players taking part in the various sections. 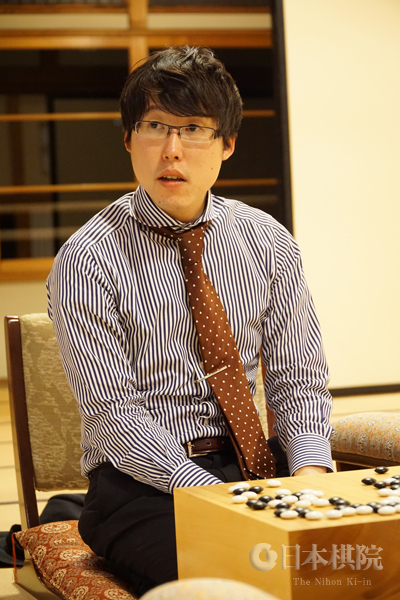 They included 35 players from Japan, of whom just one was successful: Ryu Shikun 9P in the Senior division. He will be competing in the main tournament for the third time and the first time since 2001. 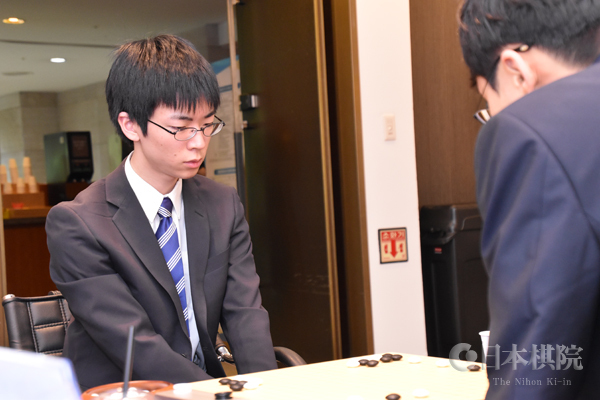 Yamashita leads S League: After three rounds, Yamashita Keigo has the sole lead in the 43rdKisei S League with a score of 3-0. He is followed by Kono Rin 9P and Kyo Kagen 7P, both on 2-1. In the A League, three players on 3-1 share the lead: Murakawa Daisuke 8P, So Yokoku 9P, and Yo Seiki 7P. In the B1 league, Tsuruyama Atsushi 7P has the provisional lead with 5-1, but Akiyama Jiro 9P, on 4-1, also has only one loss. In the B2 League, Shibano Toramaru, on 6-0, has the sole lead. (June 14) Ichiriki Ryo 8P (B) beat Cho U 9P by resig. (June 21) Kono Rin 9P (W) beat Takao Shinji 9P by resig. (July 13) Yamashita (W) beat Kyo Kagen by resig. (June 7) Yamashita Keigo 9P (B) beat Murakawa Daisuke 8P by resig. ; Shibano Toramaru 7P (B) beat Hane Naoki 9P by 3.5 points. (June 14) Ko Iso 8P (W) beat Kono Rin 9P by 1.5 points. (June 28) Cho (W) beat Yo Seiki 7P by 4.5 points. (July 5) Yamashita Keigo 9P (W) beat Takao Shinji 9P by resig. ; Yo Seiki 7P (W) beat Hane Naoki 9P by resig. Nishigami Yoshihiko died of colon cancer on June 30. Born in Osaka on March 16, 1941, Nishigami became a disciple of Hosokawa Chihiro 9P. He became 1-dan at the Osaka branch of the Nihon Ki-in 2in 1960, reached 8-dan in 1989, retired in 2006 and was promoted to 9-dan. Iyama defends Honinbo title: The fourth game of the 73rdHoninbo best-of-seven title match was held at the Hotel Hankyu Expo Park in Suita City, Osaka Prefecture, on June 12 and 13. Yamashita Keigo 9P, the challenger, who had white, took the initiative in the fighting on the first day and went into the second day with a slight advantage. But on the evening of the second day he flinched in the face of an all-out do-or-die challenge by Iyama Yuta (or Honinbo Monyu) and in a flash his lead was upset. He resigned after 189 moves. Iyama had now won three games in a row, so Yamashita faced a kadoban. Incidentally, this is the third year in a row that this hotel was scheduled to host a Honinbo game, but on the previous occasions the match ended before it reached the hotel. 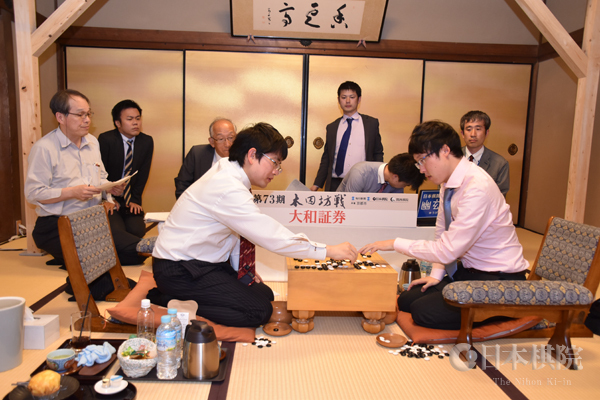 The fifth game was played at the Konjakutei inn in Aizu Wakamatsu City, Fukushima Prefecture, on June 30 and July 1. Playing white, Iyama secured a resignation after 228 moves and won the match 4-1. 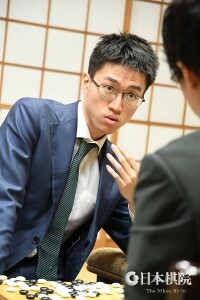 As in the previous game, Yamashita played well and seemed to have the initiative in the middle-game fighting on the second day, but when he launched an attack there was a chink in his armor; Iyama seized the opportunity to unleash a fierce counterpunch that Yamashita was unable to handle. He fought on until he ran out of options. The prize money is 30,000,000 yen (about $278,000). Iyama has now held the Honinbo title for seven years in a row, so he has matched the record of Sakata Eio (16th to 26th terms); his next goals will be the nine-in-a-row posted by Takagawa Shukaku (7th to 15th terms), then Cho Chikun’s record of ten in a row (44th to 53rd). This is Iyama’s 52nd title. He is in fourth place after Cho Chikun (74), Sakata Eio (64), and Kobayashi Koichi (60), but in his tally of big-three titles (19) he is second only to Cho (29). Also, he has won 41 top-seven titles, just behind Cho’s record of 42. Like the venues for the first and second games, the venue for the fifth game has a connection with the Meiji Restoration 150 years ago. The restoration of imperial rules was made possible by the victory of the clans supporting the restoration over those supporting the Tokugawa shogunate. After an attack by Imperial forces on Edo, the last shogun, Yoshinobu, surrendered in May 1868, but the Aizu clan, which supported the Tokugawas, continued fighting. The imperial army attacked Aizu Wakamatsu in October and the city surrendered in early November. The most famous incident in this part of the war was a mass suicide of 19 teenaged Aizu samurai in the White Tiger Corps when they concluded (prematurely) that their side had lost. This episode has been very popular in literature and film. For details of the war, check out “the Boshin war” in Wikipedia and for the suicide “the Byakkotai.” The players visited the White Tiger graves to make offerings the day before the game. Fujisawa defends 5th Hollyhock Cup: The games in the 5th Aizu Central Hospital Women’s Hollyhock Cup best-of-three were held in the space of eight days. 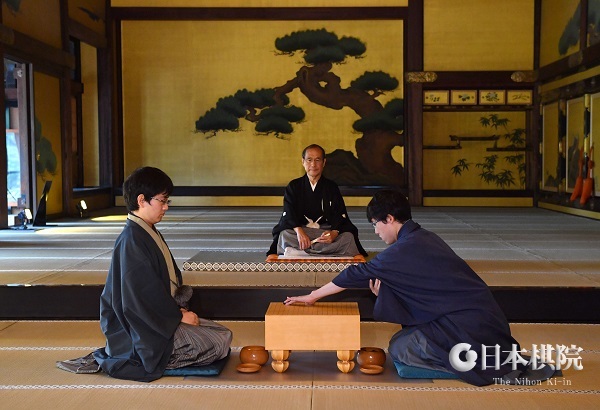 The first two games were held in the Konjakutei, a traditional Japanese inn, in Aizu Wakamatsu City in Fukushima Prefecture with just one rest day between them; the score was a tie, so the deciding game was played at the Nihon Ki-in in Tokyo after a break of four days. Xie made a good start in her bid to seek revenge for her loss to Fujisawa last year when she pulled off an upset win in the first game, but Fujisawa fought hard to take the next two games, thus defending her title. Game 1 (June 15). Xie (W) by resig. Game 2 (June 17). Fujisawa (W) by resig. Game 3 (June 22). Fujisawa (B) by resig. Fujisawa won the inaugural term, so she has now won this title three times. By my count, this is her eighth title. First prize is 7,000,000 yen (close to $65,000). Japan eliminated in LG Cup: The first two rounds of the 23rd LG Cup were held at the Konjiam resort in Gwangju City in Korea on May 28 and 30. This is a large-scale tournament, with 32 players in the first round, so I’m going to give mainly just the results of Japanese players here (I plan to give full details from the quarterfinals on when they are played). Despite making the final in the previous term, Iyama Yuta was eliminated by a player who’s a new name to me. However, Shibano Toramaru (left) made up for it by beating a previous winner of the Samsung Cup. Apparently this success attracted a lot of attention among Korean fans discussing the tournament on a chat site. However, he ran into the world’s number one player in the second round. Shibano lamented that his score against Park Jeonghwan is now 0-4, but he was happy about his first-round win. The makeup of the participants in this tournament reflects the status quo in international go: 16 Chinese players, 11 Korean, and just four Japanese, with the last player being from Chinese Taipei. The fierceness of the competition is frightening. Besides Iyama, two other semifinalists from the 22ndCup, Xie Erhao and Ke Jie, were also eliminated in the first round, as was all-time great Lee Sedol and the winner of the recent TV Asia tournament, Kim Jiseok. 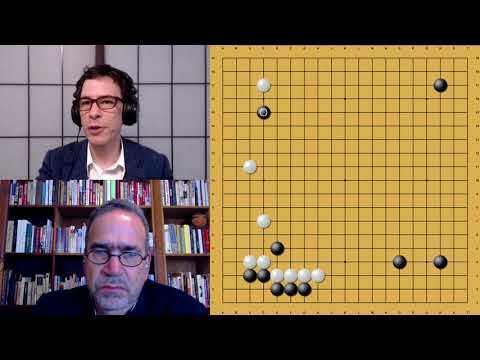 In this tournament, the winner of the nigiri chooses the color, and the influence of AI was seen in the fact that most players chose white, as the AI programs “think” the komi gives white the advantage. Actually, white won just over half the games: 13 out of 24. Round 1. Zhao Chen’u 6P (China) beat Iyama Yuta 9P (Japan) by resig. ; Yang Tianxin 6P (China) beat Ida Atsushi 8P (Japan) on time; Ichiriki Ryo 8P (Japan) (B) beat Zhong Wenjing 6P (China) by resig. ; Shibano Toramaru 7P (B) beat Tang Weixing 9P (China) by resig. ; Jiang Weijie 9P (China) (W) beat Yi Sedol 9P (Korea) by resig. ; Weon Seongjin 9P (Korea) (W) beat Ke Jie 9P (China) by resig. Round 2. Kang Tongyun 9P (Korea) (B) beat Ichiriki by resig. ; Park Jeonghwan 9P (Korea) (B) beat Shibano by resig. China wins 8th Huanglongshi Cup: The second round of this women’s team tournament for five-player teams from China, Korea, and Japan was held in Taizhou City, Jiangsu Province in China from June 5 to 8. The star of the first round was Li He 5P of China, who won five in a row before losing to O Yujin 5P of Korea (Nyu Eiko of Japan won the first game – see my report published on April 17 for more details). The result of the first round was that China had four players left, and Korea and Japan two each. In the second and concluding round, the stars were the world’s number two woman player, Choi Jeong, who won three in a row, and Yu Zhiying of China, the world’s number one, who beat Choi in the final game. Game 8 (June 5). O Yujin (Korea) (W) beat Ueno Asami 2P (Japan) by resig. Game 9 (June 5). Zhou Hungyu 4P (China) (W) beat O Yujin by resig. Game 10 (June 6). Fujisawa Rina 4P (Japan) (B) beat Zhou by resig. Game 11 (June 6). Choi Jeong 9P (Korea) (B) beat Fujisawa by resig. Game 12 (June 7). Choi (W) beat Rui Naiwei 9P (China) by resig. Game 13 (June 8). Choi beat Wang Chenxing 5P (China) by resig. Game 14 (June 8). Yu Zhiying 6P (China) (W) beat Choi by 4.5 points. Japanese team comes 6th in Chinese B League: In China, much of the action in go is to be found in the A, B, and C Leagues, in which teams are sponsored by cities or regions or by corporations. This year, too, a four-player Japanese team, officially called the China-Japan Friendship Team, took part in the 16-team B League and performed creditably by taking 6th place, an improvement on its 11th place last year (the top three teams are promoted into the A League). 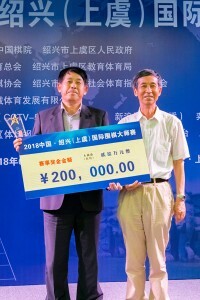 The league was held from June 11 to 20 in Wuxi City in Jiangsu Province, with each team playing eight matches (presumably it was a Swiss System tournament). The Japanese team won two matches 3-1, lost one 1-3, and drew the other five. Individual results were: Shibano Toramaru 5-3, Ida Atsushi 3-5, Yo Seiki 4-4, and Kyo Kagen 5-3. 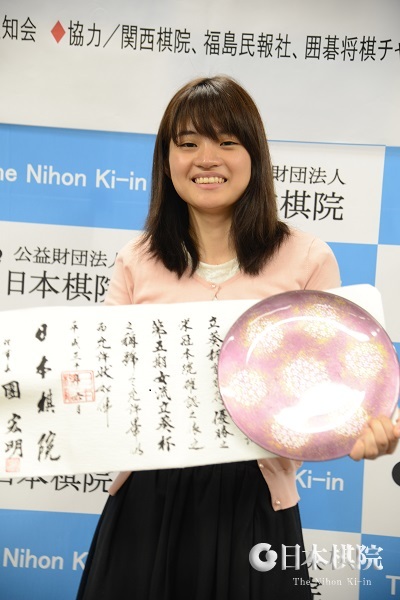 Nannami Nao wins Senko Cup: Occasionally there’s a title match for women players that doesn’t feature Fujisawa Rina and Xie Yimin. That was the case for the 3rd Senko Cup, in which the finalists were Mannami Nao 3P (left) and Nyu Eiko 2p. 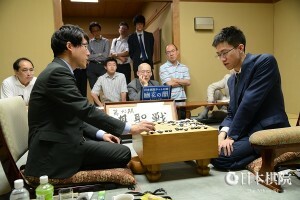 The game was played at the Guesthouse Akekure in Higashi Omi City, Shiga Prefecture, on July 15. Taking white, Mannami forced a resignation after 180 moves. This is the 32-year-old Manami’s first title — the Senko Cup is a good one to start with, as it has the top prize money for a women’s title of 8,000,000 yen (about $74,000). I hope it’s not sexist to say that her results have been good since her marriage to Ida Atsushi 8P earlier this year. Nyu missed out again in her second title match, but one consolation is that the second prize of 4,000,000 yen is almost as much as first prize in some other women’s titles. (Just for the record, Mananmi beat Fujisawa in the second round of the main tournament, which starts out with 16 players, and Xie was beaten by Yashiro Kumiko in the first round. AlphaGo vs. AlphaGo Game 20 starts off with an “AlphaGo move,” one of the moves the AI originated that has since become popular among human players. That’s followed by a joseki that’s been around for hundreds of years, giving Michael Redmond 9P “a chance to compare it with play by the great masters from the Golden Age of go” in his latest AlphaGo video commentary, hosted by the AGA E-Journal’s Chris Garlock. 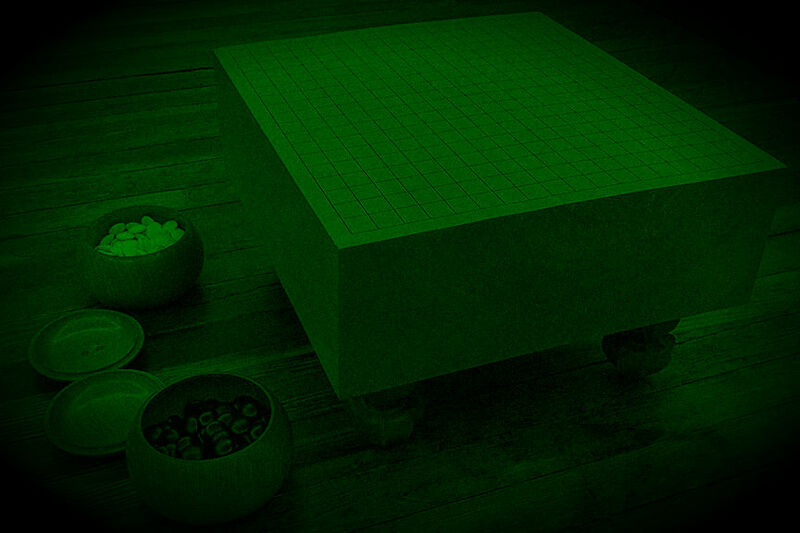 Things are fairly peaceful until the middle game, “when things get a bit confusing,” Redmond says, “and it gets exciting at the end.” Plus, this game is a very rare example of the result being different depending on which rule-set you use. Korea wins Tiantai Mountain Cup: The 7th Tiantai Mountain Shenran Yangfan Cup World Women’s Team Tournament was held in Taizhou City in Zhejiang Province in China from May 10 to 12. The venue and the dates are the same as last year, as is “Tiantai Mountain” in the name, but the sponsor seems to have changed. To be honest, I have no idea what “Shenran Yangfan” means, and the Net didn’t help. Three-women teams from China, Korea, and Chinese Taipei compete in a three-round Swiss. For the second year in a row and the fourth time overall, Korea won the tournament, but the difference from last year is that it lost a match, so the margin of victory was just one win. Japan started badly, losing to Chinese Taipei and Korea, but then it managed to beat China. Two players, Yu Zhiying of China and Kim Chaeyeong of Korea, won all their games. Results and points table are given below. 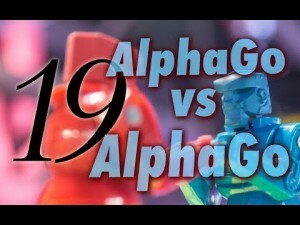 Round 1 (May 10). Chinese Taipei beat Japan 2-1; China beat Korea 2-1. Round 2 (May 11) Korea beat Japan 3-0; China beat Chinese Taipei 3-0. Round 3 (May 12) Japan beat China 2-1; Korea beat Chinese Taipei 3-0. Kyo wins Gratitude Cup: The 9th Gratitude Cup was held in Ise City on May 14 and 15. This is an unofficial tournament open to players 30 or under. It consists of fast games played by the NHK format. 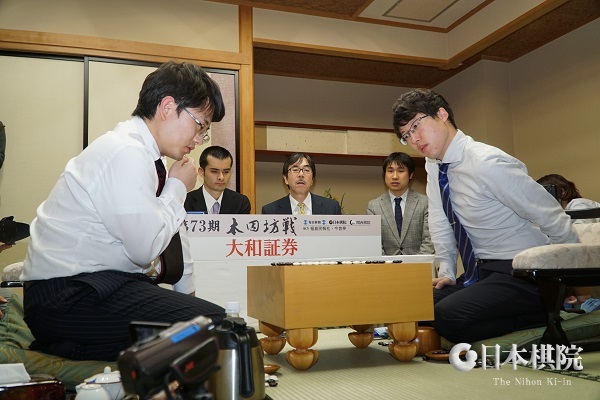 In the final, Kyo Kagen 7P (B, at right) beat Yo Seiki 7P by 2.5 points to win this tournament for the first time. First prize is 3,000,000 yen. In the play-off for 3rd place, Ichiriki Ryo 8P (B) beat Xie Yimin, Women’s Honinbo, by 13.5 points. Kyo to challenge for Gosei: The play-off to decide the challenger for the 43rd Gosei title was held at the Nihon Ki-in in Tokyo on May 17. Kyo Kagen 7-dan (W, left) beat Motoki Katsuya 8-dan (left, in photo at right) by resignation and so will make his first challenge for a top-seven title. At 20 years five month, he is the youngest-ever Gosei challenger. Motoki lost the Gosei play-off for the second year in a row. Kyo won’t find challenging Iyama Yuta easy, but he could well be in the best form of his career: his record so far this year is an impressive 17 wins 1 loss. 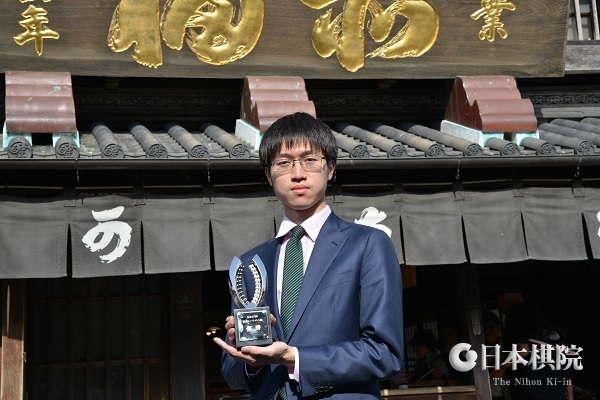 The single loss was to Xie Ke 5P in the Chunlan Cup in China, so in Japan he is undefeated (he also scored 7-0 in the Gratitude Cup, reported on above, but it is an unofficial tournament, so these wins are not included in his tally). Kyo commented that he would like to relieve Iyama of some of the burden of his septuple crown. The best-of-five begins on June 23. Xie to challenge for Hollyhock Cup: The semifinals and final of the 5thAizu Central Hospital Women’s Hollyhock Cup were held at the Konjakutei inn in Aizu Wakamatsu City in Fukushima Prefecture on May 19 and 20. In the semifinals on May 19, Xie Yimin, Women’s Honinbo, (B) beat Hoshiai Shiho 2P by resig. and Yoshida Mika 8P (W) beat Tamura Chiaki 3P, also by resig. In the final, played the next day, Xie (B) beat Yoshida by resig. Xie will meet the titleholder, Fujisawa Rina, in the best-of-three title match and will try to regain the title she lost to Fujisawa last year. So far, the two have met in six title matches, and Fujisawa has won four of them. The first two games of the title match will be played at the Konjakutei on June 15 and 17. 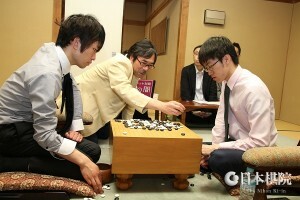 The third game, if needed, will be played at the Nihon Ki-in on June 22. Promotions: To 4-dan: Fujisawa Rina (50 wins; as of April 22); To 8-dan: Matsumoto Takehisa (150 wins; as of May 11). Retirements: Takamizawa Tadao retired as of May 31. Born in Nagano Prefecture on July 20, 1938, Takamizawa became a professional in 1955 and reached 6-dan in 1976. After retiring, he was promoted to 7-dan. Kitani Yoshimi 2-dan retired as of May 31. Born on July 23, 1952, she became a disciple of Ozaki Harumi 8-dan. She qualified as a professional in 1975 and was promoted to 2-dan in 2013. After retiring, she was promoted to 3-dan. Obituary: Yasuda Yasutoshi 9-dan died on May 2. Cause of death was not given. Born on March 1, 1964, in Fukuoka Prefecture, he became a disciple of Oeda Yusuke 9P. became 1-dan in 1980 and reached 9-dan in 1998. He was well known as a teacher and developed new teaching methods, including using go as a therapeutic tool with the senile and the handicapped. Kim wins TV Asia: The 30th TV Asia Cup was held at the Mayfield Hotel & Resort in Seoul from May 1 to 4. The tournament was won by Kim Ji-seok 9P of Korea; he beat last year’s winner, Na Hyeon 9P, also of Korea, in the final. Kim has long been one of the top players in Korea, but this is only his second international victory, following on his win in the 19thSamsung Cup in 2014. First prize is 2,500,00 yen (about $23,000). Results follow (I don’t have full details for some of the games). Round 1. (May 1) Kim Ji-seok 9P (Korea) beat Fan Yunruo 6P (China); Park Junghwan 9P (Korea) (B) beat Shida Tatsuya 7P (Japan) by resig. ; (May 2) Fan Tingyu 9P (China) (W) beat Iyama Yuta 9P (Japan) by resig. Round 2. (May 2) Kim beat Park; (May 3) Na Hyeon 8P (Korea) beat Fan. Final (May 4) Kim (W) beat Na by 2.5 points. Iyama takes lead in Honinbo title match: The 73rd Honinbo title match got off to a start in mid-May. Iyama Yuta, also known as Honinbo Monyu, has held the title for six years in a row. A successful defence will bring him level with Sakata Eio for the third best winning streak in this title (Cho Chikun won ten in a row and Takagawa Shukaku nine). Hoping to stand in Iyama’s way is the challenger, Yamashita Keigo, who held the title for two terms before losing it to Iyama. Yamashita has not won a top-seven title since 2012, which will give him added motivation. This year is the 150th anniversary of the Meiji Restoration, which led to the opening up of Japan to the world and the beginning of its rise to major-power status. This year some of the playing venues are being selected with that in mind. The first game was played at the Meirin Gakusha in Hagi City, Yamaguchi Prefecture, on May 15 and 16. Hagi was the main city of the Choshu clan, one of the four “outside” clans (that is, not allied with Tokugawa Ieyasu when he founded the Tokugawa regime) that played a major role in bringing about the restoration. The Meirin Gakusha is an elementary school that was built on the site of a school for the children of clan leaders called Meirinkan. It is associated with some of the intellectual leaders of the restoration movement. The elementary school was closed four years ago, and the building became a tourist site, with historical displays and a museum. Yamashita drew black in the nigiri. 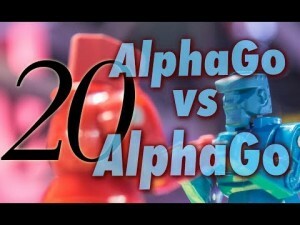 The game featured complicated fighting from early on. Although Iyama played skillfully in rescuing some groups that had come under severe pressure, Yamashita used his attack to take a very small lead. He wavered a little in the endgame, but managed to hang on and score a half-point win. This loss put an end to Iyama’s winning streak in title matches of 17 games (he just failed to match his personal record of 18). 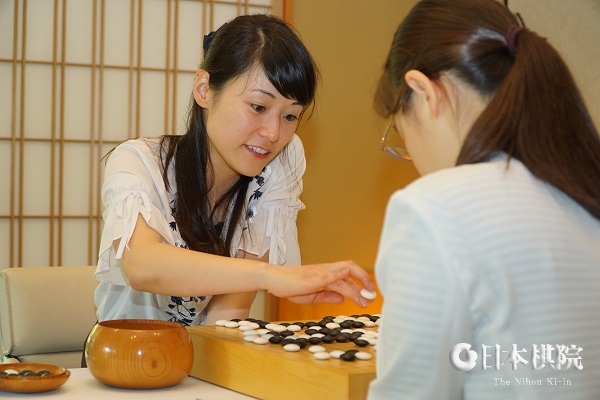 The game started out with Iyama (left), playing black, taking territory and Yamashita building a moyo. Initially, play was more peaceful than in the first game, but fierce fighting started as Iyama moved into White’s moyo. Iyama took the lead, putting so much pressure on Yamashita that he had to play riskily. Eventually, White lost a group and resigned after 171 moves. The third game (middle right) was played in the former Japanese restaurant Kaneyu (left) in Noshiro City, Akita Prefecture on June 2, 3. The name of the venue may seem a little strange. It’s an historical building which formerly housed a Japanese restauran t; when that went out of business, it was donated to Noshiro City, which uses it as a tourist attraction. (It has no connection with the Meiji Restoration, having been built in 1890 and rebuilt in its present form in 1937.) This game was played on a Saturday and a Sunday, which in one way might seem natural but is actually very unusual. Taking white, Iyama forced a resignation after 244 moves, so he now leads the match 2-1. The fourth game, which is scheduled for June 12 and 13, will be crucial for Yamashita. If Iyama wins, the match could be over very quickly, so Yamashita’s good start would go to waste.